The drill starts with a 5v1 breakout – a coach dumps a puck in and five players break the puck out against one forechecker. Two D follow the play up and then play a 3v2 rush against the forwards who broke the puck out. The forechecker backchecks the rush. These players then play a 3v3 in zone. The D who broke the puck out follow the play up. Two forwards are standing on the far blueline – when the breakout D gap up, those two forwards attack the two D 2v2. 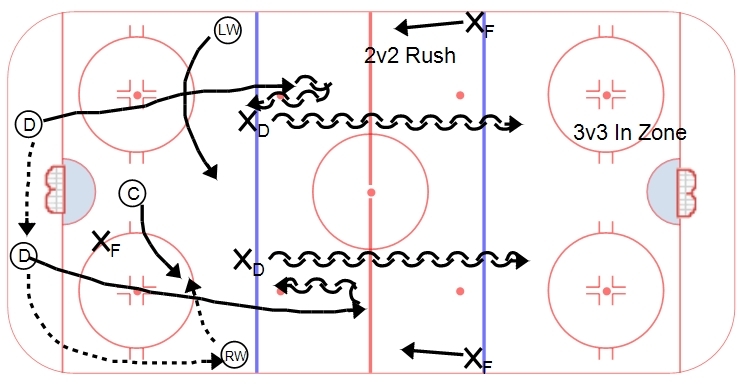 I really like this drill due to the activity on the ice, as well as the multiple concepts being worked on by the players – a breakout, rush attack/backcheck and in-zone play, as well as a quick transition rush against D attempting to get up in the play. Players can work on situational concepts and positional concepts.